A photo of Travis Brown’s daughter on a trail adjacent to the trails in the Hermosa Creek Special Manangement Area currently under review. Brown says that the profound experience of sharing this ride (four hours, 3500 feet of climbing) with his daughter would not have been possible without a pedal-assist e-bike. In a March 2016 letter from the U.S. Forest Service’s Washington, D.C. office to its regional foresters, the agency admitted that e-bike management on federal lands might change. “Monitoring of e-bike use for visitor safety, social issues, along with performance metrics and natural resource impacts, will continue to develop and advance,” the letter read. The Forest Service Columbine Ranger District, based in Durango, Colorado, has taken the blessing of the Washington office and begun exploring what e-bike use on non-motorized trails might look like, involving advocates in the decision-making. Last year, Janowiak embarked on the first, and perhaps most important, step in gathering data for creating a local e-bike policy as part of the environmental analysis process: gauging the public’s perspective. Janowiak issued special use permits to two Forest Service employees and Travis Brown so they could legally ride motorized e-bikes on trails currently open to mountain bikes only. The caveat? They had to stop and engage with other users on the trail. “People look at the bikes and say, ‘I didn’t even know this was an e-bike,'” he said. Brown echoed the sentiment. “My most common interaction is curiosity,” he said. “It’s the same as approaching another user on a mountain bike from a speed and sound perspective, so it isn’t until I stop to talk usually that the e-bike topic comes up.” Anecdotally, it could be said that most trail users don’t realize they are sharing the trail with an e-bike until they’re told as much. 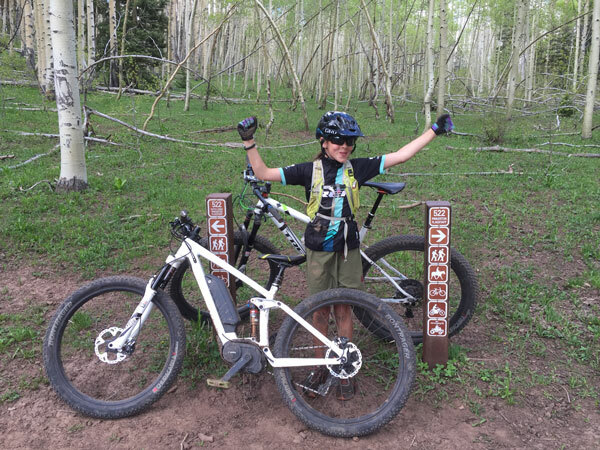 In addition to representing Durango’s local mountain bike community, Brown is also well versed on the topic of e-bike access from an industry perspective. As a research and development consultant/product developer for Trek, he has seen the growth of e-bikes worldwide and believes that policy regarding their use should be carefully crafted to support the efforts of other user groups. Janowiak is currently reviewing the 80 emails, letters, and comments generated during the public comment period to allow e-bikes on non-motorized trails in the Hermosa Creek Special Management Area. So far, he said, most have been in favor of allowing access. A decision will be made in the next year. For now, however, Janowiak plans to continue gauging the public response out on the trails, letting the e-bikes do most of the talking. PeopleForBikes is making bike riding better for everyone, and e-bikes fit within that goal. E-bikes get more people riding longer. Although federal land management agency policies currently prohibit e-bikes from traveling on non-motorized trails, there are ways to advocate for e-bikes to be included on a trail-by-trail basis, and in coordination with the local land managers and advocates. This story highlights one of those examples. Whether you are a land manager, rider or advocate (or all the above! ), you’ll find resources at peopleforbikes.org/e-bikes that help you advocate for, and find, a great ride.